Writing this, I was trying to think of something snappy for the title. Dr. Dan the Bandage Man, came to mind. That was one of my favorite books when I was a wee lad. Looking at Amazon.com, I saw that it's back in print and even comes with bandages for the reader's patients. Quality literature never goes away. Anyway, we had to go see our family doctor here in Corozal, Dr. David Reyes, M.D., for some stuff related to Belize and the Immigration Department. Since I'm becoming less young than I used to be, of necessity, he found a couple of things about me that concerned him. Dianna, of course, is still 39. So, off we went to get those things checked out. 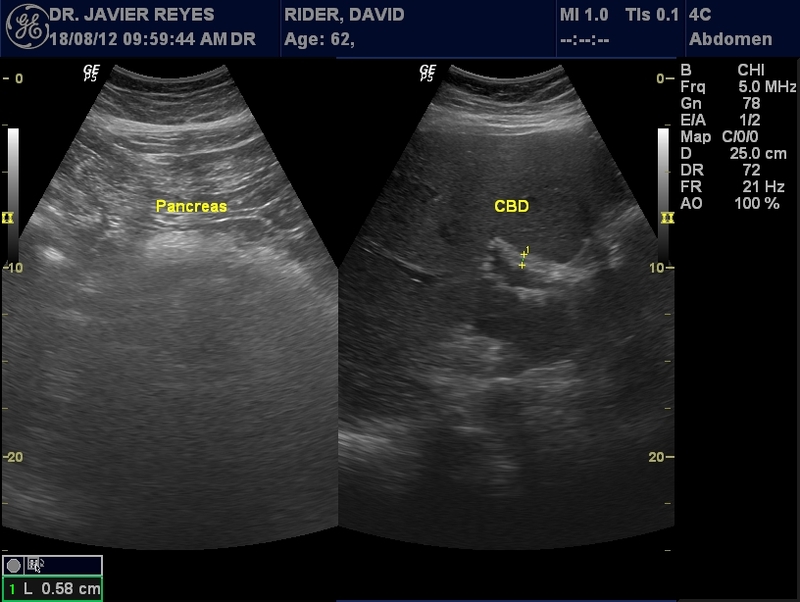 He wanted me to have an abdominal ultrasound done, so we went to La Ascencion Radiodiagnostics (http://laasuncionradiodiagnostics.com/) in Orange Walk. It just so happens, the Radiologist is Dr. Javier Reyes, M.D., a close relation of my doctor. 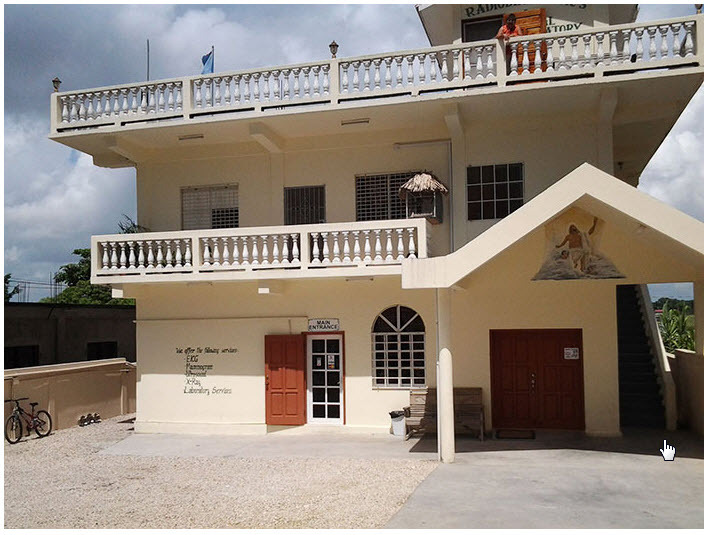 Here's a picture of the outside of the center in Orange Walk - a very nice place. Very professional and up-to-date. We were impressed. BTW, I 'borrowed' the photo from their website as I had forgotten to bring my camera, so my thanks to the Center for that as well. Not only did I get an ultrasound (complete with a souvenir CD of all the ultrasound images) on of which, I reproduced below, but we took advantage of the facilities and we each had a chest x-ray done as part of the requirements for the immigration process. Getting an appointment was surprisingly easy, compared to my experiences with similar clinics in the states. We went to see our doctor on Friday morning. When we got home, I called La Ascencion Radiodiagnostics to see about scheduling an appointment. I was very surprised when they said, "Sure. How about 8:30 AM tomorrow morning?" Once we got to the center, our wait was reasonable, and the service was very professional. We got our x-rays first and then I went in for the ultrasound. I've never had one before, so it was interesting. Laying on the platform/bed, I even had a monitor up on the wall so I could see just what the radiologist was looking at at the same time. Pretty cool experience. And, I even got a souvenir CD out of it (that cost extra - $10.00 BZD). Oh, you're interested in costs, eh? Ok, here's the breakdown. The Panabdominal Ultrasound cost $130.00 BZD, and the Chest X-rays - $75.00 BZD each. Don't forget the CD. We also paid 13.50 BZD to have the x-rays and the radiologist's report on them shipped to us via BPMS (Belize Package and Mail Service) - similar to UPS up north. The center had had a couple of emergency patients come in from the hospital and we would have had to wait for the reports till sometime that afternoon. So, it was easier to have BPMS bring them to Corozal, where I picked them up on Monday right after lunch. The grand total came to $303.50 BZD. Pretty reasonable, I think. I must say, it was altogether a pleasing experience. Y'know, the longer we're here, we've been more and more impressed with the level of medical care available here in Belize. Maybe not necessarily at the government-run hospitals - but that care is essentially free, so you have to keep that in mind, but the range of services and the quality of care available through private clinics, etc., is nothing short of outstanding. Now, that comes from a couple of folks who's lifetime medical experiences are mostly military hospitals and clinics, with a somewhat limited civilian medical experience when we had careers after the military experiences, so we may have some sort of bias regarding levels of medical care. I must say, Dave, that this is one of your best portraits so far in your blog. Especially the one on the right (the left one is a little vague) side that looks so dapper. Had the same procedure done a few months ago, and while I can't remember the exact cost I will bet you that my nurse was cuter than yours!!! Glad you're ok -- can't wait to hear about your next colostomy -- they are such fun! It took me a second or two to figure out 'portrait'? You so funny! I'm hoping you mean colonoscopy vs. colostomy. Although neither's much fun, the former has a much easier recovery. I think it's a cost-cutting measure... no nurse. You are right... I indeed meant colonoscopy (can't spell it right on two days straight!). I'm not even sure what the thing is that spelled out but I don't want to know more. Anyhow, glad to see such good medical work down there. I really liked the way you could go talk to the pharmacist in Corozal, explain your condition and then get 20 antibiotic pills for $5 USD... neat. Got to go get into my book, just took up Patrick O'brian for the first time. Makes me want to read the Hornblower books again. O'Brien is one of my absolute favorites. A good book to accompany his books is another one titled 'A Sea of Words' by King, et al. It's a 'Lexicon and companion' for his books since O'Brien doesn't waste time explaining what a 'fid' is, for example. Another good book is actually a cookbook - 'Lobscouse and Spotted Dog' by Grossman and Thomas, two ladies who got caught up in the stories and researched the foods he mentions and created updated recipes for all of them. I'm currently reading Bernard Cornwell's 'Sharp' series - about a British soldier fighting the French in the same era. I rate it about the same for excitement as O'Brien's books - only it mostly takes place on land. On a different note, if you're into SF at all I just finished all of the Lost Fleet novels by Jack Campbell. These are very good "navel" strategy set in space... very well done and believable. Glad the latest storm is missing you by a nice distance this time. Never have read any of Slaughter's - I'll look him up. I have all of the Hornblower series. Aubrey-Maturin is very similar, just with more detail. I discovered the Lost Fleet about two years ago. I've been sharing those with my neighbor, Doug. I'm not up to date on them. I need to get more. Thanks for the "A Sea of Words". I spent 6 years in the Navy and, while I do know and have a "fid", there are a lot of words that I could use some help with. Some went out of style over 150 years ago. Went to eBay and found 20 for sale and got one for $4.97 free freight -- hard to beat. Hey, I was in that canoe club for a while myself. You want a real kick - look up a book titled DICNAVAB: The Dictionary of Naval Abbreviations. You can get it from the US Naval Institute Press. Curious about the chest x-ray. Is that required to gain permanent residency in Belize? Don't think I've heard that as of yet. The price was definitely right, but I hate unnecessary x-rays (having had more than my share of medically necessary ones up til now). The chest x-ray is on the list of required items for both Permanent Residency and Nationality. Having said that, we were not required to have it for our Residency process. Individual results may vary (depends on who's on duty). They do seem to be sticklers thoough for the final stage of things. BTW, x-rays are available from the local hospital for quite a bit less. Since we were at the center for the ultrasound, we just went ahead and had them do the x-ray as well. Thanks Dave! So you are going for citizenship, then? Good luck! Enjoy the blog Dave, and Dianna keep it up. Amazing post,thanks for sharing, I like your blog! I'm glad you like the post and the blog. It has been and still is a fun thing to write. Hi! I'm so happy to have found your blog! It's great and very informative. We're thinking about making a move from Uruguay to Belize next year. Since it sounds like you've been through it, could you tell me what medical tests are required for residency? All the websites I've read just say medical exam results, but no one specifies. Thanks!